The Oulipo, or Ouvroir de Litterature Potentielle, is a Paris-based group of writers and mathematicians that explores the uses of writing of constrictive form. Because Raymond Queneau, one of the group's two founders, attended Kojeve's lectures along with Lacan (in fact he assembled the lectures on the Phenomenology of Spirit); because Queneau attended some of Lacan's seminars; because the group's insistance on following specific procedures, we find their relevance to Lacanian theory fertile ground for exploration. Literature and game playing, literature as game playing... The words evoke a weedy figure: the playful writer. The playful writer, probably male, never young (although often juvenile), sauntering nonchalantly down sunny boulevards... Faber ludens  a little ludicrous, too; hardly dangerous; hardly serious. Another image of game-playing: a six-year-old girl playing hopscotch, in dead earnest. How much has the Oulipo mattered to me, and why? It is hard to answer simply, because its influence has been gradual, because I had strong non-Oulipian feelings about three of its members, because my devotion to the group involves much more than its ideas. Was I an Oulipian before the fact? I long thought so. I used to claim that the Oulipo had only favored and not changed the course of my writing. (After all, I had written my first three novels without even hearing of it.) I was not yet aware of what the Oulipo was in fact changing: my understanding of the act of writing. This has been an insidious process. My non-Oulipian feelings concerned Raymond Queneau, Italo Calvino, and Georges Perec. Towards Queneau and Calvino they were literary (I had met Queneau once or twice): the two were exemplary modernists at a time when the founders of modernism had become museum pieces. Queneau's writings in general showed what originality might now look like; Exercices de style provided an instruction manual. Calvino's inventiveness in the domain of fiction gave me hope of not seeing my own work automatically condemned to an idiosyncratic backwater. Perec was my best friend. When he brought me to the Oulipo, I followed not out of conviction or even curiosity, but because I trusted and loved him. Two short works I had already written were Oulipian by any definition: a homophonic reading of the alphabet, and what was later called a transplant  a lexical exchange between two texts, where each is rewritten with the vocabulary of the other. My original transplant combined a poem of Keats with a cooking recipe. From it I learned: I) Once a problem is set, I must solve it. 2) No matter how absurd, a problem once tackled quickly convinces me that a "true" solution exists. 3) Finding any solution can be excruciatingly difficult. 4) To pursue such activity, I might well be, if not insane, perverse to the point of perversion. Being welcomed into the Oulipo made me feel like someone who has been denying a shameful habit only to discover that it is perfectly honorable. One immediate privilege the group offered was being able to pursue these experiments not only systematically but independently of my other writing. They were an object of research to be happily pursued for its own sake. This separation of experiment and practice was of course illusory; a sense of innocence, however, averts the anxious gaze of conscience. I exercised my new freedom on a small scale, exploring possibilities of lexicons and letters, only gradually realizing how it was leading to the resolution of problems thought insoluble for example, how to write works in French. Eventually, and by then almost naturally, I decided to use an Oulipian method of my own invention to compose my next novel, and writing Cigarettes definitively proved to me the validity of the Oulipian idea. It brought me full circle to my beginnings as a novelist. I had then been psychologically trapped inside the society that I wanted to portray; I thought I could only do so in its own literary terms. That society now still supplied the context of my narrative but, approached with the indirectness of abstract procedure, it became an imaginary object, and so accessible. I was no longer its creature but its inventor. les mots sont les signes  qu'il y a des choses. Et ces choses sont les signes de l'incompréhensible. During a recent stay in Berlin, I became friends with the poet Oskar Pastior, no Oulipian but nonetheless addicted to combinatorial stratagems. Each of us proposed methods unfamiliar to the other: I sestinas, he anagrams. We began exploring their possibilities. The projects I then undertook were ferociously hard: a three-part composition based on anagrams of our two names distributed according to 3 x 24 permutations; a sestina consisting entirely of anagrams of its six end-words. I ate frugal, hasty meals; slept little; neglected my friends. During those long hours, I have no doubt that, to an unobtrusive observer, my face would have manifested the oblivious intentness of a six-year-old girl playing hopscotch. 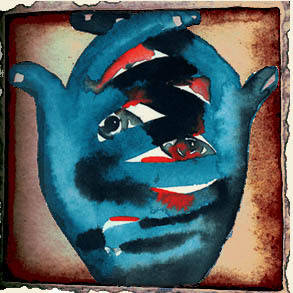 Art by Francesco Clemente, from Evening Raga, 1992.